Homeowners in most of the country are surprised when they come to southern states and learn many homes don’t have basements. And considering the immense percentage of homes with basements that are finished, this tends to illicit plenty of questions. Basements were originally designed as a storage space for water, wine and food. Being underground spaces, they were traditionally damp, musty places wherein whatever is stored should be protected in glass or tin. However, with advances in technology, such as sump pumps and dehumidifiers, dehumidifying these spaces has become increasingly seamless. In addition to technology to eliminate the moisture from basements, thus making them much more habitable, society has evolved to require much less storage in our homes. 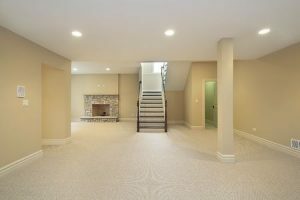 Subsequently, instead of musty old storage spaces, home basements became increasingly used as recreation rooms and spaces to entertain… unless, of course, the home doesn’t have a basement. The percent of homes north of the Mason-Dixon Line with basements is close to 90%. In the sandy soil compositions found in states from Maryland to Florida and as far out west as California, many homes were never built with basements. They are replaced in southern states with outdoor storage sheds and attic storage. And this is for a number of reasons. The chief culprit of most missing basements in the South is damp soil. This is especially true in places like Florida, Alabama, Louisiana, and eastern Texas. States that have a lot of swamp land or wetland territory, as well as those with significant amounts of coastline, simply have too much water in the ground to make most basements feasible. When the water table is less than a meter under the ground, as it is in south Florida, the requisite eight or more feet of depth for a basement is simply not possible. Even in drier climates, the clay composition in the soil can make basements impractical or even dangerous. While this kind of soil doesn’t have enough water in it to cause flooding, mold, or rot, it can play havoc with the basement walls. The clay takes on water and then dries out, resulting in significant expansions and retraction that put strain on walls of any kind. Because of the aforementioned soil movement issues, a loose pack ensures that the foundations and flooring of the basement will rise and fall dramatically throughout the seasons, especially in summer when rainfall and high heat result in rapid expansion and contraction. To counter this, builders should start basement and foundation projects with a strong soil pack and even consider adding a lime mixture to ground trenches to offset the moisture levels. Building foundations need to be below the frost line to avoid freezing and cracking in pipes. In cooler climates, the frost line is several feet below the surface, which is why many Northern homes have basements. It’s simply more practical to install a basement if the foundation is already this deep to begin with. In warmer places, like central Florida and Georgia, the frost line tends to be much closer to the surface. Subsequently, home builders don’t bother with the extra expense of building a basement. Also, many Southern states only have a shallow layer of soil over a much harder layer of limestone bedrock. While limestone is soft as far as solid rock goes, it’s still no small task to dig into it. After a land survey, it’s easier to get an estimate of what it would cost to break through the rock under a basement-free house’s soil. So if you are a northerner used to having a basement rec room and considering relocating anywhere south of Maryland, you may want remember how hard pressed it will be to find one under an existing structure. You can also have basements added to your home. Though this may be quite costly, having a basement in a housing market wherein they might be rare could be quite the selling point. But yet many Florida homes have pools, large holes in the ground with huge weight numbers, (water). How would you construct a useable basement in florida ? They said the negative pressure from the loose soil and the clay that absorbs and dries out will put unwanted stress on the walls and foundation. A pool on the other hand has a positive force pushing back towards the pressure from the soil equalling out forces. That’s why you contractors prefer certain times of the year, and no rain for weeks when building a pool.